To Cite: Shokoohi R , Salari M , Arabkoohsar A , Dargahi A, Faraji H , et al. Performance of Advanced Oxidization UV/S2O8-2 in Removing Acid Green 3 from Aqueous Solutions: Modeling Based Linear Regression, Kinetic Studies, J Kermanshah Univ Med Sci. 2018 ; 22(3):e74139. doi: 10.5812/jkums.74139. Background: Used in the dyeing industry, Acid Green 3 has a complicated molecular structure and a low level of biodegradability. The present study investigated the removal of Acid Green 3 from synthetic solutions by UV/S2O8-2. Methods: This cross-sectional study was conducted at the laboratory scale. The effect of time (5 - 60 min), pH (3 - 11), Acid Green 3 concentration (50 - 150 mg/L), and dose of S2O8 (10 - 50 mg/L) was studied under the UV radiation with 510 mJ/cm2 intensity and 636 nm wavelength. Spectrophotometer (wavelength of 636 nm) was used to measure remaining concentration of Acid Green 3 after each experiment. Linear regression was used to create an appropriate linear model. Results: Results showed a removal percentage of 95% was achieved under the optimal conditions of the studied variables: pH = 3, Acid Green 3 = 50 mg/L, S2O8-2 = 50 mg/L and time = 60 min. The kinetics of UV/S2O8-2 process for all the investigated variables followed the pseudo-first-order kinetic model. In addition, the removal efficiency of COD for Acid Green concentrations of 50, 100, and 150 mg/L were about 78%, 53%, and 41%, respectively. Linear regression analysis yielded a model with R2 = 0.852 and adjusted R2 = 0.792. Conclusions: In the current study, the variables of Acid Green 3, S2O8-2, contact time, and pH were effective on the process efficiency. Regarding the high efficiency of UV/S2O8-2, this process could be employed for the removal of Acid Green 3 and similar compounds from industrial effluents. The increasing expansion of industries followed by the discharge of industrial wastewater into the environment has led to concerns regarding surface and underground water pollution and environmental degradation. Industrial wastewater is of great significance as various types of pollutions exist with different qualities and quantities (1). Different types of dyes are a major pollutant entering the environment through industrial wastewater. For a long time, dyes have been utilized in dyeing, textile, plastic, cosmetics, and food industries. It is estimated that about 10% - 15% of the dyes produced via industrial operations and processes are discharged into wastewater effluent. Some dyes and their precursors may be cancerous for humans due to producing toxic aromatic amines (2). These pollutants enter aqueous environments, prevent the entrance of light and, thus, provide the conditions for eutrophication (3). Due to their complex molecular structure, dyes have a poor biodegradability and may prohibit the growth of microorganisms due to their toxic properties (4). Other common methods for the removal of dyes from aqueous environments, e.g. coagulation, adsorption, and membrane processes, only separate dyes and increase their concentration in the resulting sludge, while they fail to destroy the structure of these pollutants or turning them into simple compounds (5). It has been proven that advanced oxidation processes (AOPs) are a good choice for treating wastewaters which cannot be easily treated using biological processes. The basis of treatment in AOP processes is the production of active radicals such as hydroxyl radical (OH•) (6). Photochemical processes are a branch of AOPs in which UV radiation activates chemical compounds to generate OH• radicals. If used alone, the UV ray has a low ability for directing oxidating organic compounds and may even produce byproducts with an even poorer biodegradability (7-9). Therefore, the application of compounds which would accelerate active radical production is essential. UV/S2O8-2 is an AOP method with a significant expansion in environmental pollutant removal processes. The widespread use of S2O8 in AOP processes may be its high oxidation ability (2.01 V), stability, low cost, easy storage, high solubility, and production of highly active radicals SO4- with the oxidation potential of 2.5 - 3.1 V and OH• with the potential of 1.8 - 2.8 (10-12). Equations 1 - 3 show the pathways for the production of these radicals. In general, upon dissolving in water, the persulfate salt produces S2O8-2 which does not have a high oxidation power. To increase the oxidation ability of S2O8-2 which is produced as a result of sulfate radical production SO4-, various chemical (hydrogen peroxide), thermal (temperature), and radiation (UV ray) methods are employed. Studies have shown that the ambient temperature and solar radiation do not have a high efficiency for activating persulfate salt and, as a result, pollutant removal. Therefore, the use of high temperatures or UV light is essential for producing SO4- radicals. UV waves have found widespread use in industries, medicine, and chemistry due to their unique properties. These waves are used for the treatment and removal of organic pollutions and pathogens (13). Veisi et al. compared UV ray and solar radiation for activating TiO2 nanoparticle (NP) in order to remove furfural from aqueous solution. They observed that UV ray has a higher potential compared to solar radiation in activating this catalyst. The reason for this difference is reported to be the concentrated nature of UV light and shorter distance of UV from the NP (14). Zhang et al. observed that the elimination rate constant of sulfamethoxazole, trimethoprim, and N4-acetyl sulfamethoxazole using the UV/PDS method is in the range of 2.35 × 109 - 16.1× 109 m-1.s-1 (15). Moreover, Saien et al. reported the elimination efficiency of salicylic acid as 94% using the UV/KPS method at the concentration of 1000 mg/L of potassium persulfate and pH of about 6 (16). Based on the positive properties of S2O8-2 as an oxidating agent, in the present study, the removal of Acid Green from synthetic solutions was examined using the UV/S2O8-2 method, and the effects of time, pH level, dye concentration, and dose of S2O8-2 on the efficiency of this method were examined. Moreover, the kinetic model was evaluated for each variable. Finally, the data of the factorial method were used for fitting a linear regression model. The present descriptive cross-sectional study was conducted at laboratory scale and in a sequencing system to examine the efficiency of the UV/S2O8-2 process in the removal of Acid Green 3 (C37H37N2O6S2Na) from synthetic aqueous environments. Chemicals used in this study included Na2S2O8 (99% purity), sodium hydroxide (NaOH), and normal sulfuric acid 1 (H2SO4) purchased from Merck (Germany). Moreover, Acid Green 3 used here was procured from Alvan Sabet Co. (Hamadan, Iran). To perform the experiments, an AC photoreactor (Philips, the Netherlands) with a volume of 2 L was employed. A low-pressure mercury-vapor UV lamp with the radiation intensity of 510 mJ/cm2 and the radiation wavelength of 254 nm was installed in the center of the photoreactor and covered by a quartz glass cover. The outer surface of the photoreactor was made of steel, and water flowed between these two layers. A vacuum pump fully mixed the input sample. The schematic view of the reactor is presented in Figure 1. The effects of time (5, 15, 3 45, and 60 min), pH (3, 7, and 11), Acid Green 3 (50, 100, and 150 mg/L), and S2O8-2 (doses of 10, 30, and 50 mg/L) were examined. A digital pH meter (HACH) was utilized to adjust pH. 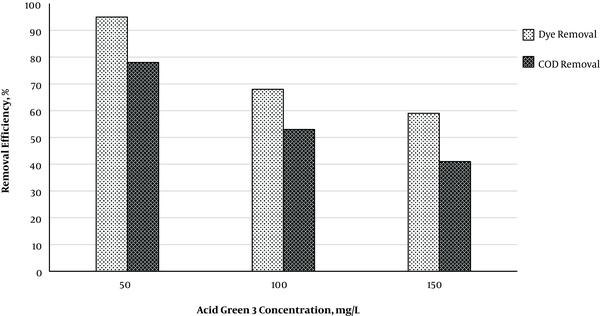 To assess the remaining concentration of Acid Green 3 after each experiment, a UV/Vic spectrophotometer (DR5000, USA) at the wavelength of 636 nm was used. Equation 1 was used to determine removal efficiency. Here, C0 is the initial dye concentration (mg/L), Ce is the dye concentration at the time of equilibrium (mg/L), and E is the removal efficiency (%). All experiments were conducted in triplicate and values are reported as mean. Moreover, the COD remaining after each experiment was assessed using the 5220C method based on the “Standard Method for the Examination of Water and Wastewater” (17). Microsoft Excel Software was used to draw the diagrams. Furthermore, to obtain a linear model, linear regression analysis was run on the data of the factorial method in SPSS V. 16. As shown in Figure 2, the removal percentage had a rising trend for all three methods from 5 to 20 min. The minimum removal percentage belonged to 5 min (3, 5, and 56%) and the maximum removal percentage belonged to 60 min (10, 16, and 88%) respectively for S2O8-2, UV, and UV/S2O8-2 methods. Removal efficiency was higher in the UV/S2O8-2 method at 60 min (78% and 72%, on average) compared to UV and S2O8-2 methods, respectively. Thus, the UV/S2O8-2 process was used to examine the other factors affecting the removal of Acid Green 3. Figure 2. Efficiency of S2O8-2, UV, and UV/S2O8-2 processes in the removal of Acid Green 3 (Acid Green 3 concentration = 50 mg/L, pH = 7, and S2O8-2 concentration = 50 mg/L). It was revealed that the removal efficiency is higher at acidic pH than neutral or basic pH levels (Figure 3). Removal efficiency was 65%, 81%, 91%, 93%, and 95% at times 5, 10, 20, 40, and 60 min at pH = 3, respectively. Moreover, removal efficiency had an increasing trend with time, and the slope of the removal efficiency was decreased at times > 20 min. The oxidation constant coefficient for the first-order kinetic at pH of 3, 7, and 11 respectively equaled 0.0525, 0.0218, and 0.0168. Figure 4 illustrates the effects of initial Acid Green 3 concentration on the removal efficiency. Results showed that removal efficiency is higher at lower concentrations of Acid Green 3. By increasing the concentration of Acid green 3 from 50 to 150 mg/L, removal efficient was times 5, 10, 20, 40, and 60 respectively equaled 33%, 39%, 34%, 36%, and 36%. The oxidation constant coefficient for the pseudo-first-order kinetics at the concentrations of 50, 100, and 150 mg/L of Acid Green 3 respectively equaled 0.0307, 0.0117, and 0.0093. COD determination experiments were conducted to determine the level of mineralization of Acid Green 3. Based on Figure 5, at optimal conditions of the variables, COD removal efficiency is lower than that of Acid Green 3. Results indicated that Acid Green 3 removal efficiency at concentrations of 50, 100, and 150 is respectively 17%, 15%, and 18% higher than that of COD. The level of mineralization equaled 78%, 53%, and 41% for the UV/S2O8-2 method at the three mentioned concentrations of Acid Green 3. The effects of S2O8 dose on removal efficiency are shown in Figure 6. It is evident that the minimum removal efficiency was obtained when using UV alone, and increased by increasing the dose of S2O8-2. The application of UV/S2O8-2 at the dose of 50 mg/L of S2O8-2 compared to the use of UV alone at times 5, 10, 20, 40, and 60 min led to 45%, 36%, 38%, 38%, and 37% increase in efficiency, respectively The oxidation constant coefficient for the pseudo-first-order kinetics at the concentrations of 50, 30, 10, and 0 mg/L of S2O8-2 equaled 0.0314, 0.0207, 0.0162 and 0.009, respectively. ANOVA was performed to yield a linear model for the data resulting from previous experiments for the optimal condition of variables (Table 1). Finally, using linear regression analysis, a model with the R2 = 0.852 and adjusted R2 = 0.792 was obtained (P < 0.001). This model was developed in the form of Equation 4, where X3, X2, X1, R, and X4 respectively indicate efficiency, persulfate concentration, pollution concentration, pH, and time. Furthermore, the Pareto diagram is depicted in Figure 7 to compare the effects of variables and calculate the percentage of their effect on the response (using Equation 5). Here, b is the regression coefficient of each term in terms of the values of standardized coefficients or codes. 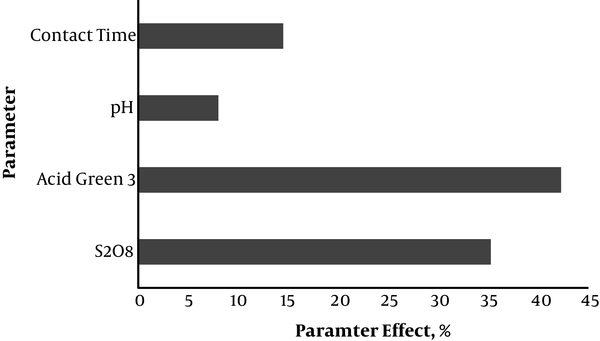 To determine the validity of the results predicted from the linear regression, for various values of variables, laboratory and predicted removal efficiencies were calculated from the model (Table 2). Based on the R2 of the model, the predicted values are close to laboratory values. The present study examined the efficiency of advanced oxidation using the UV/S2O8-2 method on the removal of Acid Green 3 and determined the effects of variables affecting removal efficiency. Without activation, the persulfate anion directly reacts with organic compounds and, in this condition, the removal percentage is lower than that of activated states. This decrease in efficiency by the persulfate anion is the result of lack of production of radicals. This is also true for UV because it has a low efficiency when used alone, whereas the presence of persulfate produces persulfate radicals by breaking the bonds of oxygen molecules, thereby leading to a synergistic increase in Acid Green 3 removal (12). Results revealed that increasing the time increases removal efficiency by giving enough time for the reaction and oxidation of Acid Green 3 dye with active radicals, thereby increasing removal efficiency. Of course, the rate of removal was decreased with time, probably due to the reduction in a considerable part of the pollution and active radicals as a result of the fast reaction at the beginning of the process. Consequently, by decreasing the concentration of pollutant and S2O8-2 dose at longer times, the rate of reaction is decreased. Moradi et al. removed azo dye using the nano-ZrO2/UV/Persulfate method and reported that the parameter if time is the most effective factor for removal with a 45.5% effect (18). Removal efficiency increased at acidic pH levels. In general, the basis of the S2O8-2 compound for removing Acid Green 3 is the production of SO4- radical. The production of this radical is higher at acidic than basic pH levels because, by increasing pH, the SO4- radical reacts with H2O or -OH molecules, thus producing OH•. The rate of this reaction is low for H2O (< 2 × 10-3 M-1 s-1) and increased for -OH at basic pH levels, such that at pH levels higher than 11, the reaction rate increases up to 6.5 ± 1 × 10-3 M-1 s-1 (19). Therefore, at basic pH levels, the OH• radical is the major oxidating factor which is produced as a result of basic conditions and has lower efficiency. On the other hand, the oxidation ability of the OH• radical is lower than SO4- (20). Moreover, at basic pH levels, the intensity of oxidation is decreased due to the increased formation of SO4-• which acts as a scavenger. These explain the reduced removal efficiency at basic pH levels in the present study. Zhang et al. reported that the maximum removal efficiency of carbamazepine occurs at pH = 2 using the UV/S2O8-2 method (21). It was found that removal efficiency has a decreasing trend by increasing the dye concentration. By increasing the concentration of dye and keeping the S2O8-2 concentration constant, SO4-radicals remains constant and, therefore, the ability of the process decreases for higher concentrations of dye, leading to a decrease in efficiency. On the other hand, the penetration of UV ray is decreased in the sample by increasing dye concentration, thereby reducing S2O8-2 photolysis and, consequently, reducing the efficiency (22). It is critical to reduce the concentration of an organic compound and determine its fate because the mere degradation of an organic compound in the wastewater is not sufficient, and what matters is to know the level of its mineralization. Results showed that the COD removal percentage was approximately 18% lower than that of Acid Green 3. Therefore, this percentage is part of the removal of Acid Green 3 which is converted into intermediate organic compounds, and the COD removal percentage is part of the removal of Acid Green 3 which is mineralized into CO2 and H2O. Amin et al. observed a 93% TOC removal at the 100% dye removal conditions (23). Furthermore, Georgiou et al. used UV/H2O2 for the oxidation of reactive azo dye and obtained the TOC removal efficiency of 80% - 82%. They observed that mineralization increased by increasing time, and thus reported the increase in time as the most important factor for increasing COD removal efficiency (24). It was also observed that the removal efficiency is much lower with UV alone than with UV plus S2O8-2, and that the efficiency increases with increasing S2O8-2 concentration. The application of UV alone leads to the direct oxidation of organic compounds which has a lower efficiency. In this method, through direct radiation, the chemical bonds of the dye are degraded and, as radiation continues, bonds are broken, leading to the degradation of the organic compound. These reactions are caused by the radiation of photons resulting from UV radiation (7). However, with UV radiation in the presence of S2O8-2, the photolysis process occurs which produces highly active SO4- radicals which have a high ability for oxidating organic compounds (12). Moreover, by increasing the concentration of S2O8-2, an increase was observed in efficiency due to the increase in SO4- radical compared to the dye concentration, consistent with the results of Moradi et al. (18). One must keep in mind that SO4- radicals may be neutralized at higher S2O8-2 concentrations, based on Equation 6, thus decreasing the efficiency of the process (25). Lou et al. reported the humic acid degradation efficiency to be about 78.3% at the S2O8-2 concentration of 7.5 mM, while this efficiency was decreased to 70.1% at higher concentrations of S2O8-2 (15 mM) (25). The linear regression model was significant with the predictive power of 85.2% of the variance in the response, and the fact that R2 was close to adjusted R2 indicates desirability of the model. Moreover, in comparing laboratory and predicted values under equal conditions of variables, results showed a good convergence, demonstrating the good predictive power of the model. It appears that the part unpredicted by the model resulted from the interaction effects and the squared values of the studied factors. In the response surface methodology, the effects of these factors are determined, while the linear regression model cannot determine these effects on the response. In addition, in examining the effect of each variable on the response (Figure 7), it was revealed that the maximum effect on the response belonged to Acid Green 3 concentration (42.2%), followed by the dose of S2O8-2, contact time, and pH levels (35.2, 14.5, and 8%, respectively). In general, the results showed that time, pH level, dye concentration, and S2O8-2 dose are parameters affecting the removal efficiency. Based on the optimal level of the studied variables, the maximum efficiency of UV/S2O8-2 for removing the dye and COD equaled 95% and 78%, respectively, which were significant. Therefore, this method can be used for removing Acid Green 3 and similar pollutants from industrial wastewater since it can meet the standard requirements for removing this dye from industrial wastewater. As the present study was conducted at the laboratory scale, and the effects of scavengers were not examined, it is recommended that future studies design the same system at larger and industrial scales and investigate the effects of scavengers. The authors thank the Hamadan University of Medical Sciences for assisting in the present study (Code: 9505122711). 1. Dargahi A, Sharafi K, Almasi A, Asadi F. [Effect of biodegradable organic matter concentration on phenol removal rate from oil refinery wastewater using anaerobic pond system]. J Kermanshah Univ Med Sci. 2015;18(12). Persian. 2. Xu X-R, Li X-Z. Degradation of azo dye Orange G in aqueous solutions by persulfate with ferrous ion. Sep Purif Tech. 2010;72(1):105-11. doi: 10.1016/j.seppur.2010.01.012. 3. Liu H-L, Chiou Y-R. Optimal decolorization efficiency of reactive red 239 by UV/ZnO photocatalytic process. J Chin Inst Chem Eng. 2006;37(3):289-98. doi: 10.1016/j.cej.2005.07.012. 4. Fernades Rego FE, Sales Solano AM, da Costa Soares IC, da Silva DR, Martinez Huitle CA, Panizza M. Application of electro-Fenton process as alternative for degradation of Novacron Blue dye. J Environ Chem Eng. 2014;2(2):875-80. doi: 10.1016/j.jece.2014.02.017. 5. Shokoohi R, Dargahi A, Amiri R, Ghavami Z. Evaluation of US/S2O8-2 compilative process performance in the removal of Erythrosine B dye from aqueous solution. J Adv Environ Health Res (JAEHR). 2018;6(1):1-8. doi: 10.22102/jaehr.2017.95646.1033. 6. Yazdanbakhsh A, Mehdipour F, Eslami A, Maleksari HS, Ghanbari F. The combination of coagulation, acid cracking and Fenton-like processes for olive oil mill wastewater treatment: Phytotoxicity reduction and biodegradability augmentation. Water Sci Technol. 2015;71(7):1097-105. doi: 10.2166/wst.2015.080. [PubMed: 25860714]. 7. Yuan F, Hu C, Hu X, Wei D, Chen Y, Qu J. Photodegradation and toxicity changes of antibiotics in UV and UV/H(2)O(2) process. J Hazard Mater. 2011;185(2-3):1256-63. doi: 10.1016/j.jhazmat.2010.10.040. [PubMed: 21074943]. 8. Rezaee R, Maleki A, Jafari A, Mazloomi S, Zandsalimi Y, Mahvi AH. Application of response surface methodology for optimization of natural organic matter degradation by UV/H2O2 advanced oxidation process. J Environ Health Sci Eng. 2014;12:67. doi: 10.1186/2052-336X-12-67. [PubMed: 24735555]. [PubMed Central: PMC3999503]. 9. Shokoohi R, Ghovami Z, Dargahi A, Vanaee Tabar M. [Evaluating the efficiency of ultrasonic and persulfate compilative process in Eosin Y dye removal from aquaeous solutions]. J Color Sci Tech. 2017;11(4):265-74. Persian. 10. Zhang Y, Zhang J, Xiao Y, Chang VWC, Lim T-T. Kinetic and mechanistic investigation of azathioprine degradation in water by UV, UV/H2O2 and UV/persulfate. Chem Eng J. 2016;302:526-34. doi: 10.1016/j.cej.2016.05.085. 11. Mohammadi F, Alimohammadi M, Mahvi AH, Nazmara S, Mazloomi S, Askari M. [Evaluation of the removal of hydrocarbons from soil media using persulfate oxidation in the presence of mineral siderite]. J Health Res Commun. 2016;2(2):19-28. Persian. 12. Mazloomi S, Nasseri S, Nabizadeh R, Yaghmaeian K, Alimohammadi K, Nazmara S, et al. Remediation of fuel oil contaminated soils by activated persulfate in the presence of MnO2. Soil Water Res. 2016;11(2):131-8. doi: 10.17221/39/2015-swr. 13. Azadbakht F, Esrafili A, Yeganeh Badi M, Sajedifar J, Amiri M, Gholami M. [Efficiency of persulfate-based advanced oxidation process (UV/Na2S2O8) in removal of metronidazole from aqueous solutions]. J Mazandaran Univ Med Sci. 2017;27(154):119-29. Persian. 14. Veisi F, Zazouli MA, Ebrahimzadeh MA, Charati JY, Dezfoli AS. Photocatalytic degradation of furfural in aqueous solution by N-doped titanium dioxide nanoparticles. Environ Sci Pollut Res Int. 2016;23(21):21846-60. doi: 10.1007/s11356-016-7199-7. [PubMed: 27525742]. 15. Zhang R, Sun P, Boyer TH, Zhao L, Huang CH. Degradation of pharmaceuticals and metabolite in synthetic human urine by UV, UV/H2O2, and UV/PDS. Environ Sci Technol. 2015;49(5):3056-66. doi: 10.1021/es504799n. [PubMed: 25625668]. 16. Saien J, Osali M, Soleymani AR. UV/persulfate and UV/hydrogen peroxide processes for the treatment of salicylic acid: Effect of operating parameters, kinetic, and energy consumption. Desalin Water Treat. 2015;56(11):3087-95. doi: 10.1080/19443994.2014.963156. 17. Classer LS, Greenberg AE, Eaton AD. Standard method for the examination of water and wastewater. 21st ed. Washington DC: The American Water Works Association; 2005. p. 589-691. 18. Moradi M, Ghanbari F, Manshouri M, Ahmadi Angali K. Photocatalytic degradation of azo dye using nano-ZrO2/UV/Persulfate: Response surface modeling and optimization. Korean J Chem Eng. 2015;33(2):539-46. doi: 10.1007/s11814-015-0160-5. 19. Xu Z, Shan C, Xie B, Liu Y, Pan B. Decomplexation of Cu(II)-EDTA by UV/persulfate and UV/H2O2: Efficiency and mechanism. Appl Catal, B. 2017;200:439-47. doi: 10.1016/j.apcatb.2016.07.023. 20. Buxton GV, Greenstock CL, Helman WP, Ross AB. Critical review of rate constants for reactions of hydrated electrons, hydrogen atoms and hydroxyl radicals (⋅OH/⋅O− in aqueous solution. J Phys Chem Ref Data. 1988;17(2):513-886. doi: 10.1063/1.555805. 21. Zhang Q, Chen J, Dai C, Zhang Y, Zhou X. Degradation of carbamazepine and toxicity evaluation using the UV/persulfate process in aqueous solution. J Chem Tech Biotech. 2015;90(4):701-8. doi: 10.1002/jctb.4360. 22. Daughton CG, Ternes TA. Pharmaceuticals and personal care products in the environment: Agents of subtle change? Environ Health Perspect. 1999;107 Suppl 6:907-38. doi: 10.1289/ehp.99107s6907. [PubMed: 10592150]. [PubMed Central: PMC1566206]. 23. Amin H, Amer A, Fecky AE, Ibrahim I. Treatment of textile waste water using H2O2/UV system. Physicochem Prob Miner Process. 2008;42:17-28. 24. Georgiou D, Melidis P, Aivasidis A, Gimouhopoulos K. Degradation of azo-reactive dyes by ultraviolet radiation in the presence of hydrogen peroxide. Dyes Pigm. 2002;52(2):69-78. doi: 10.1016/s0143-7208(01)00078-x. 25. Lou X, Xiao D, Fang C, Wang Z, Liu J, Guo Y, et al. Comparison of UV/hydrogen peroxide and UV/peroxydisulfate processes for the degradation of humic acid in the presence of halide ions. Environ Sci Pollut Res Int. 2016;23(5):4778-85. doi: 10.1007/s11356-015-5232-x. [PubMed: 26538259].